Sri Kaleshwar’s interpretation of ancient knowledge of Vaastu differs from many of the prevailing ideas. For example, he teaches that some south and west entrances are acceptable, like the south-southeast entrance depicted in this illustration. For more information, see Victory Through Vaastu. The property is aligned to the cardinal directions. The house is aligned to the property. The southwest corners of both the property and house form perfect 90o angles. The property shape is an auspicious east-west rectangle. A compound wall surrounds the entire property. The patio creates a powerful northeast extension to the house. The property slopes down to the northeast. The house placement creates greater open space to the north and east. Property entrances in the north-northeast and middle south. The middle south property entrance is exactly centered. The driveway entrance is in the south-southeast. House entrances are in the north-northeast, east-northeast and south-southeast. The main entrance in the south-southeast is aligned to an opposite-facing door. All the interior doors are located in auspicious directions. There are large windows on the east and north sides of the house. The roof and floor levels follow the Principle of Height: highest in the southwest, then southeast, then northwest and lowest in the northeast. The northeast room of the house is open and unobstructed. 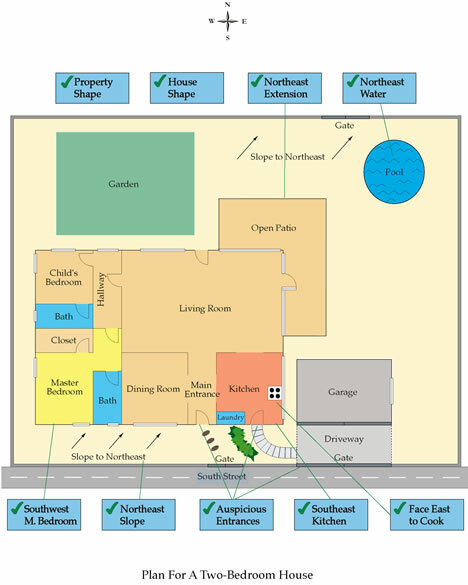 There are no bedrooms or bathrooms in the northeast quadrant of the house. Master bedroom is located in the southwest quadrant; child’s room is in the northwest. The kitchen is located in the southeast quadrant of the house. The stove is situated so that one faces east while cooking.